Chainsaw also supports loading a events logged to a file using the XMLLayout format. This is great for analysing log files, and means you do not need to keep Chainsaw running continously. It is easy to add support for loading events from other sources like JDBC. Chainsaw is based on the Swing API which requires JDK 1.2 or later. You need to include the log4j.jar in the classpath. chainsaw.port Indicates which port to listen for connections on. Defaults to "4445". You will need to configure log4j to send logging events to Chainsaw. 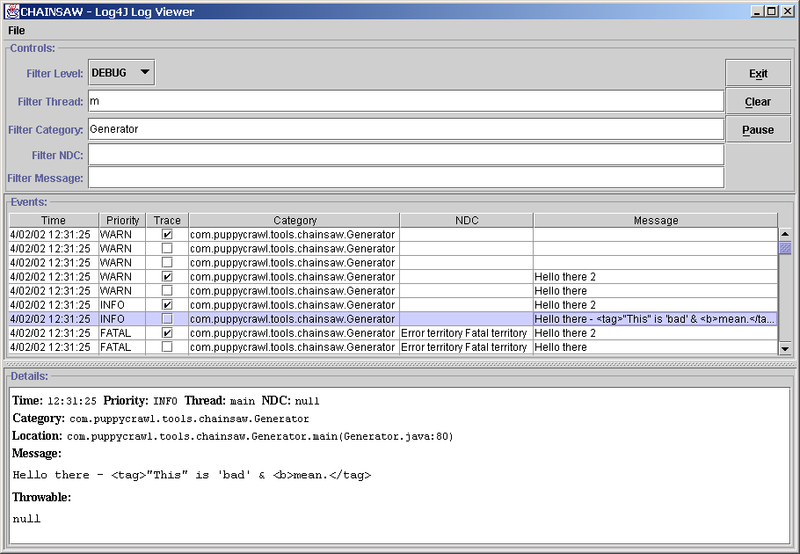 Here is a sample log4j.properties file for sending logging events to Chainsaw.